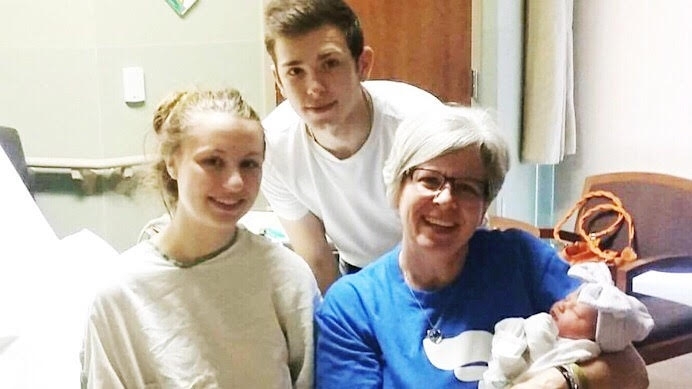 Sydney (left) may have chosen abortion for her sweet baby Blaire were it not for Michele Menke (right), who revealed her baby’s heartbeat to her via ultrasound at Hand ‘n Hand Pregnancy Help Center in Barnhart, Missouri. In 1985, a silent and numb seventeen-year-old girl named Michele tagged along as her boyfriend’s mother took care of the paperwork—first for her pregnancy test in a Missouri strip mall, and then for her abortion at a clinic in West St. Louis County. “The majority of my life I lived as ‘the girl who had an abortion’,” said Michele Menke, the nurse manager for Hand ‘n Hand Pregnancy Center in Barnhart, Missouri. Only no one knew that secret but Michele, her boyfriend, and his mother. For decades, fear ruled her life—fear of exposure, fear of her parents’ disapproval, and fear that her sorrow would never end. But fear, she says today, is a liar. Having grown up in a church-going family, she would have described herself as pro-life. She barely looked at the counselor’s sheet of paper that listed all her options. She just passed it to her boyfriend’s mother. The status of her pregnancy was estimated by pelvic exam, not by ultrasound. Two days later, she showed up for her procedure. A staff member who barely remembered her first visit sat beside her, while a masked doctor who never spoke to her performed the abortion. Even worse than the physical pain, which came to an end, was Menke’s emotional pain. “I started to cry that evening, and I don’t think I quit crying for twenty years,” she said. Never sharing her painful secret with family or friends, she moved on through life, eventually marrying, raising a family, and earning her nursing degree. While administering physical healing to her patients, she worked hard to hide her own emotional and spiritual scars. Yet her pain never went away. But accepting God’s forgiveness didn’t guarantee that other people would forgive her. So when her church hosted an event supporting the nearby Hand ‘n Hand Pregnancy Center, Menke felt she had to sneak over to sign up as a volunteer. In 2004, when the youngest of her five children was a toddler, Menke joined Hand ‘n Hand Pregnancy Center as a volunteer receptionist. Alongside a client, she participated in the center’s abortion recovery program, working through the study Surrendering the Secret. Through the program, Menke’s healing progressed further. She moved from re-examining old memories of her abortion to processing them and experiencing new freedom in Christ. In time, she found a way to bring hope to other women by opening up about the very secret she had hidden all her life. Back then, she could only silently assent to choices that had been made for her. Now, her role at Hand ‘n Hand Pregnancy Help Center allows her to create a warm and caring environment in which pregnant women know they can make their own choices—equipped with all the facts, including an ultrasound view of their babies. Since 2015, when her center began offering ultrasounds, Menke has served as nurse manager. Today, she works with two other staff members, 40 volunteers, and 40 support members. On average, Menke provides 15 sonograms a month, a number which has grown steadily in the three years since the Knights of Columbus first donated the machine. She quickly discovered clients often wanted to hear her own story to help them decide what to do. Roughly 93 percent of the clients who receive an ultrasound at Hand ‘n Hand Pregnancy Help Center choose life for their babies. But for those who don’t, Menke still keeps the door open. Ultrasound is only one of the ways Menke and her center make choosing life easier for women who hadn’t planned to be pregnant. The center also offers “Caring Hands,” a program in which women meet with a caregiver to discuss video lessons on pregnancy and baby care. And “Get Connected” is their monthly moms’ group that meets to share a meal, a Bible study, and lessons in life skills. In addition, mothers can receive material needs support up to a child’s second birthday. The only requirement is that they stay connected with the center by checking in with updates at least once every four months. Yet one piece of business remained unfinished until last year: telling her parents about her abortion. In December of 2017, her church published weekly videos featuring different members telling their stories of redemption. Menke was set to be one of them. One week before her video was to be released online, she took her parents to lunch and told them her long-guarded secret.